Chris and I both LOVE PF Chang’s chicken lettuce wraps. They are amazing, and anytime we order them, they are gone pretty quickly. Since this is something that is relatively easy to make, I decided to try to make a healthier version at home by cutting out the noodles and doubling up on the veggies. 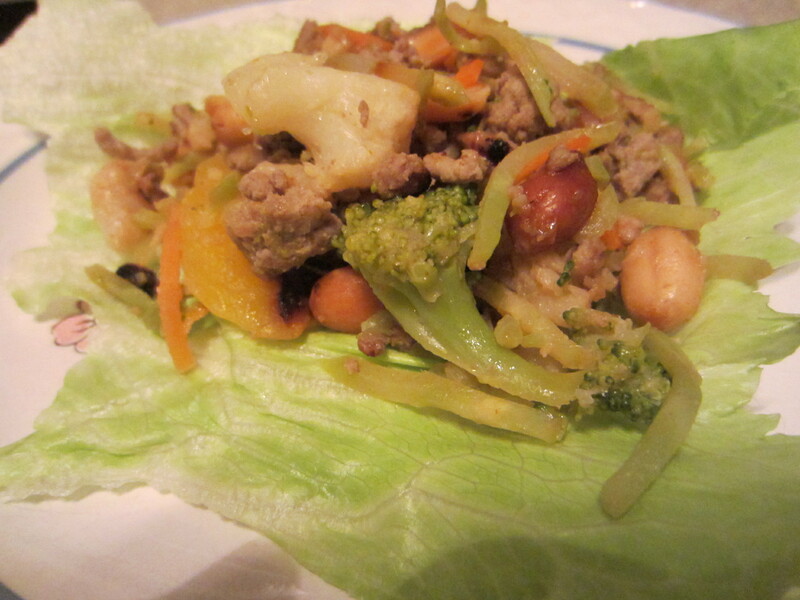 This week I made some lettuce wraps for dinner for Chris, Brad, and their friend Clark. They were gone pretty quickly! 1. Heat the oil in a large skillet on medium high heat. Add turkey and let cook until brown. 2. Add vegetables. Cover skillet and reduce heat to low. The veggies are done when slightly limp. 3. Add peanuts and sauce. Stir and let simmmer for a few minutes so the flavors can mix. Serve on lettuce leaf, folded like a taco and enjoy! Refrigerates well. This is also good on steamed rice.